Naive Art, also known as Outsider or Primitive Art, is a label used to describe untrained, self-taught artists whose work is filled with awkward technical “deficiencies”. It seems weird but the most famous of these “naive” artists, Henri Rousseau, was championed by people like Picasso and Maurice Denis – some of the most intelligent and advanced artists of the late 19th and early 20th century. Why? His ambitions were completely different to the avant garde. Comically, the artist he aspired to be was the Academic painter par excellence Jean-Leon Gerome. But as he lacked all the taught skills of painting and drawing, of technically skilled “copying”, he made up simple, schematic visual equivalents. Rousseau depicted reality in an unusual, non-straightforward manner, and achieved a strange kind of beauty which was undeniable. You could say exactly the same thing of Cezanne. Ironically, in the cartoon Rousseau’s The Sleeping Gypsy is juxtaposed alongside a painting by Peter Paul Rubens, who was probably the most technically expert painter who ever lived. He is like the Kelly Slater of painting, in total mastery of every aspect of his craft. 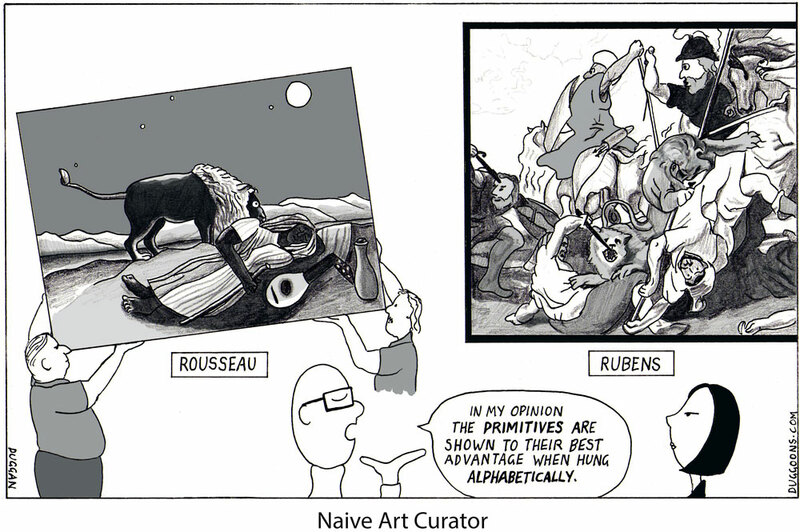 Surprisingly, Picasso loathed Rubens. His main beef was that everything in a Rubens painting, whether it be a breast, a plant, or a fold in a robe, is described in the same way – as a curve. Picasso’s comments on art are always very astute – it is a very good point. But it is only a flaw if you want to see it that way. 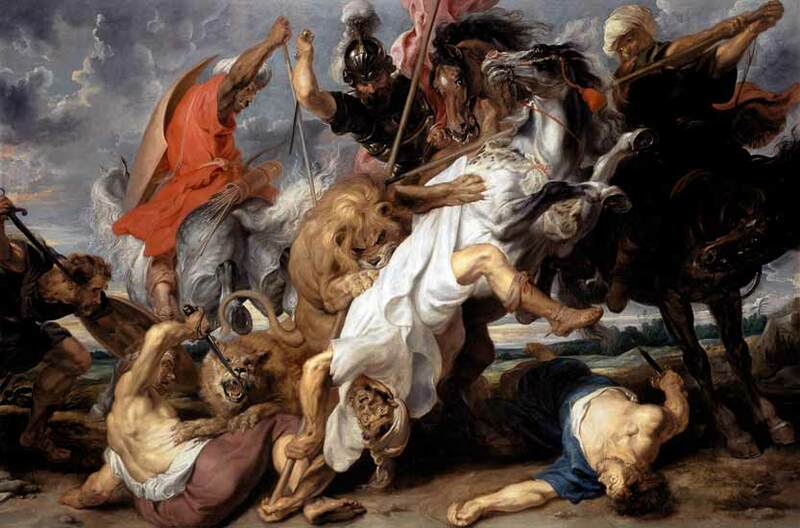 Rubens’s art was one of dynamism, and filling his canvases with flaming S-shaped curves was the main way he achieved it. Look at any drawing Rubens made of someone else’s work; his “copy” is invariably more dynamic, more (perhaps superficially) thrilling. Picasso’s view on Rubens is as instructive on his own work as it is about Rubens. It reveals his love of opposition and contrast. It reveals why there is often something unpalatable and jarring about his work, why it sticks in your craw. If Picasso was Mondrian I’m sure he would have put a squiggle in there. Well that was a digression. Just a quick word about “The Sleeping Gypsy” (I’m trying not to digress again but it is one of my favourite paintings so bugger it). As I said before, Rousseau compensated for his lack of technical ability by finding simple visual equivalents to represent reality. His main formal device was his way of painting every thing in a single straightforward fade from light to dark. If he painted a tree he would paint each leaf individually, shading it in one single fade from light to dark. Repeated over and over, this shimmering pattern, combined with his beautiful colour sense, is quite ravishing. This way of shading is fine with objects that could conceivably be represented as one simple, smooth shape, but he would get very muddled with complicated, bumpy shapes like a face. It’s funny scanning a Rousseau picture. Look at the Gypsy’s “pillow”. The vertical stripes are light at the top and get darker as they go down. The stripes along the Gypsy’s legs are also shaded separately from top to bottom, but because they are horizontal they turn into thin tubes. His hair is the same. It’s great. These repeated glowing stripes throughout the picture – lion’s mane, cloak, lute strings, hair, even his tube-y toes – create a lovely visual rhythm. The twinkling of the stars continue in the scattering of small circles of light throughout – toenails, fingernails, the tuners of the lute, the eye of the lion. This visual magic is unloaded onto a scene pregnant with possibility – threat, stillness, animal mind, human mind, curiousity, intensity, relaxation, danger, dream. This is what visual poetry looks like.